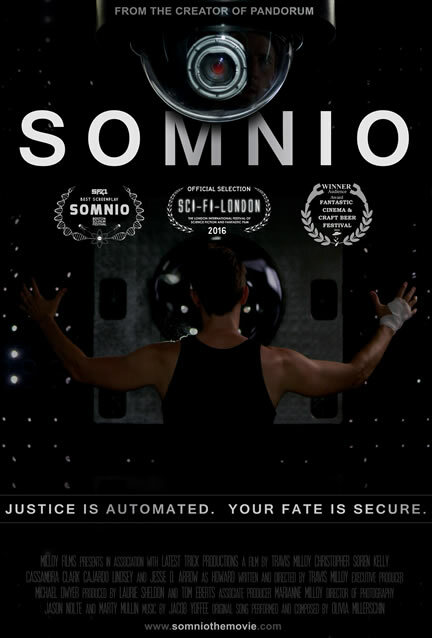 Somnio has been the darling of the independent film circuit this year. Even before it was completed, it won best screenplay at the Boston Sci-Film Festival, won the Audience Award at the Fantastic Cinema & Craft Beer Festival, and was an Official Selection at the London International Festival of Science Fiction and Fantastic Film. I was fortunate to get to view the film recently and it’s fantastic. I think comparisons to Moon and Minority Report both give you a sense of the style of the film and somehow do nothing to convey what the movie is about. The movie, written and directed by Travis Milloy, is about a man, Frank (Christopher Soren Kelly), imprisoned in a near-future prison and his relationship with his jailer, Howard (Jesse D. Arrow), a likeable guy swept up by larger forces. The cell is equipped with a machine that puts Frank in a dreamlike state and presumably allows Howard’s higher-ups to scan his memories for evidence of crimes. Frank tries to figure out how to escape and whether he can convince Howard to help him, even as he becomes suspicious that the world outside the prison may have fallen to dark forces. Somnio is one of my favorite kinds of movies. I like a movie that, like Babe Ruth, swaggers up to the plate, points to exactly where it’s going to put the ball (or, in this metaphor, move the narrative), and, even though it just does exactly what it told you it was doing, I’m still surprised and delighted. A character in the movie flat out tells the audience what’s going on, how the trick is working, and yet I never saw the scope of it until the end. Think less The Usual Suspects and more Penn and Teller. It’s also the kind of movie that, when you finish it, you immediately want to discuss it with someone. Sadly, I watched it alone. So, I took all my nerdy movie thoughts to writer and director Travis Milloy, which was even better than hashing it out with a friend (sorry friends). APEX MAGAZINE: Howard reminded me a great deal of the type of character Joss Whedon excels at — the low-to-midrange bureaucrat who’s just trying to do his terrible job with maybe a modicum of humanity. I don’t want to spoil things for viewers by talking too much about why that characterization of Howard was so brilliant on your part (though I will say that, as much as I love Wheadon, I was glad to see a movie interrogating that kind of character), but I do want to talk about what it means to have Howard as the authority figure. He’s literally holding Frank prisoner, providing Frank with everything Frank needs to survive, and providing Frank with his only companionship. He’s in charge — at least he’s as in charge as we ever see anyone on his side in the movie being — but his characterization is that he’s just a dude doing what he has do to do get by in the world and he doesn’t know any more than the limited amount he’s supposed to know. Howard surely is the antagonist of the movie, but I still have really mixed feelings about whether he’s the bad guy. It’s just so good! Did you have in mind all along that he’d be likeable? That it’d be hard to see him as a bad guy? TRAVIS MILLOY: Yes, I never really pictured Howard as a villain, even though he’s the antagonist. I like the idea of blurring the lines about who is a villain and I like to take characters that feel real, have a set of beliefs, and then challenge those beliefs and morals. In essence, Howard isn’t doing anything wrong, he’s doing his job and the fact that Frank actually did lie and commit a crime makes him even more in the right. (That’s a bit of a spoiler.) So I don’t think it’s necessarily a question of right or wrong in a legal sense, it’s more so challenging someone’s ethics, if that makes sense. I really wanted to tell a story where there is no villain. The villain is our society, where we’ve gone, the decisions we’ve made along the way to create a judicial system that at one point made sense but becomes something beyond our control. AM: While I was watching Somnio, Trump was announcing his vice-presidential pick, Turkey was embroiled in a coup that the world was watching in real-time, and people on Twitter were begging other people to stop sharing the picture of an American Sikh man and claiming that he was the Nice truck driver. So, I had the weird experience of watching the movie seem less and less futuristic as it went along. When I started the movie, it seemed fifteen, twenty years off. By the end, it seemed like people could be in Frank’s position next year. Could you talk a little bit about your world-building? How did you decide what the near future would be like? TM: I left the future date ambiguous for a few reasons. One, we didn’t have the budget to create a completely futuristic environment but more importantly I didn’t want it to seem too far into the future because it’s harder to connect to that world. I just wanted it to feel “real” and have signs of where we might be headed, more automated and more under observation. Personally, I don’t think our world will look as different twenty or thirty years from now as a lot of sci-fi films portray. Only my opinion, but if we hopped into a time machine and went twenty years into the future, my guess is we’d be surprised at how similar it would appear. If you look at pictures of cities from 1986, (thirty years ago) there’s really not that much difference. Sure, cars a bit different, clothes and hair styles slightly altered, but that’s about it. I just don’t think the appearance of our world changes as fast as most sci-fi films portray. So on that note, I just added very small details to the environment and I tried to make things monochromatic, relying on a black and silver color palette as much as possible. But like I said, I didn’t want it to be too far in the future with flying cars, etc. I wanted it to be something we could more closely relate to. 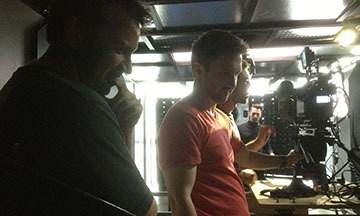 From left to right: Writer/Director: Travis Milloy, Cinematographer: Jason Nolte (red shirt), A/C: Vincent Patin and Christopher Soren Kelly in the background. AM: [Note to readers: I don’t think this question is specific enough to count as a spoiler, but it may be a little too spoiler-adjacent for some people’s taste. Please skip it if you’d rather not risk it.] One thing I found really interesting about Somnio is that Frank’s survival mechanism is his capacity for fiction — his ability to lie. I feel like we, as a culture, spend a lot of time trying to thread a needle of “lying is bad, but storytelling is okay.” I think, though, that you’ve made a defense of lying, a story in which lying and a capacity for lying is what makes us human and what lets us survive. Frank, ultimately, is a deceiver, but he’s also the character we’re rooting for. It’s really, really interesting to me that your guileless, honest character, who cannot help but be who he is, is your antagonist and your liar is your protagonist. Do you think a capacity for deceit is actually a positive quality? TM: That’s an interesting point. And I think this plays into the dilemma of morality and where different people draw the line ethically. Is it okay to lie for the greater good or to deceive for self-preservation? And also, it’s blurred lines with what is accused and what is being admitted or denied. Frank has a certain amount of deception but never blatantly lies. He claims he did nothing wrong but in my mind, the things he had done were not wrong, they were for the greater good, so I guess in his own mind, he’s not really lying, he’s just not telling the entire truth. But existing in a society where the governing body has broken the rules, in my mind this excuses Frank’s actions. Since the government is making up their own rules, he has to do what he needs to survive and succeed. Plus, Frank never really does anything for his own personal gain, I see him as a soldier who is willing to take the risk and sacrifice himself to help others. That in itself I believe is an admirable quality. It’s interesting because while we were making the film, Chris would question how deceptive Frank should seem, since he is actually hiding a secret. We agreed that Frank should never seem like he has a secret agenda or knows something we don’t. AM: You raised money for Somnio on Kickstarter. I know independent film-makers spend a lot of time raising money so that they can make their films. But, I presume, in the days before Kickstarter, you had to go to people with lots of money. One thing I find interesting about Kickstarter is that it allows people who previously never would have been artists’ patrons to support art they find interesting. I wonder, what, if anything, changes for you about moving making when it’s not one or two people giving you thousands of dollars, but a hundred people giving you twenty dollars or fifty or a hundred? TM: Kickstarter was a wonderful experience and even though we didn’t raise the initial money to make our movie with it, I don’t know if Somnio would have been done without it. We tried to raise money for the production but we fell short of our goal. But by using Kickstarter it opened the doors to a lot of people who were interested in what we were doing and created a buzz we couldn’t have gotten otherwise. It was because of this buzz that got us introduced to our investors and really got the project off the ground. We went back to do another Kickstarter campaign when we needed additional money to complete the film and it was amazing how supportive people were. It felt like we gained a whole new circle of friends, much like a family to get the movie completed. AM: When I interviewed Christopher Soren Kelly, who stars in Somnio, a few months ago, we talked about the necessity of letting a story change from the thing you have in your head at the beginning to the thing it becomes in the end. Were there big changes in Somnio from what you first imagined to the end result? Would you mind telling us about one? What’s your writing process like? TM: Yeah, I guess the movie starting as one thing and evolving into something else is really the exciting part about film making. You never really know what is going to work and what is going to fail from the page to the screen and that element is what I find exhilarating. It’s a journey of discovery to make a good movie and there were lots of things that did and didn’t work. The biggest change was the structure of the first act and this was something I didn’t deal with until I was editing. When I edited the film as it was meant to be in the script something wasn’t working for me. The first fifteen minutes are so important, whether you can hook the audience in the right way, and the movie just wasn’t moving at the right pace. I wasn’t quite sure what could be the solution but I tried to separate myself from the material and observe it more as an audience member than a film maker and I went at the edit from another direction. I completely altered the structure of the first thirty minutes and it started to work. The other big thing was the character of Howard. (Spoiler alert!) I had written him more “human” in the script and I really wanted him to feel very flawed and as “normal” as possible with the way he spoke and reacted to things. But while we were making the movie and while I was editing, it seemed more interesting that Howard had difficulty in acting human and couldn’t quite express emotion or react in a human sense. It gave Frank and Howard’s relationship more dynamic the more artificial Howard became. My writing process has changed over the years. I use to write in a more traditional sense, doing an outline and laying out the structure of the story but now-a-days I’m a lot more bold (or foolish, depending on how you look at it) and I always start writing without any idea of where it’s headed. I like to jump into a situation or scenario without really knowing anything and see what happens. It’s foolish because most of the time it doesn’t work and I don’t know where to go or how to finish it but every once in a while it does work and it’s a thrill. For me, by using that technique, without knowing where it might go gives it a more unexpected and less formulaic feel. Betsy Phillips is a writer who lives in Whites Creek, Tennessee. Her fiction has appeared in Apex Magazine, F&SF, and other outlets. Her hobbies include crocheting, wandering old cemeteries, and burping loudly, though never at the same time. Yet. You can find her on Twitter at @auntb or at her website betsyphillips.net.